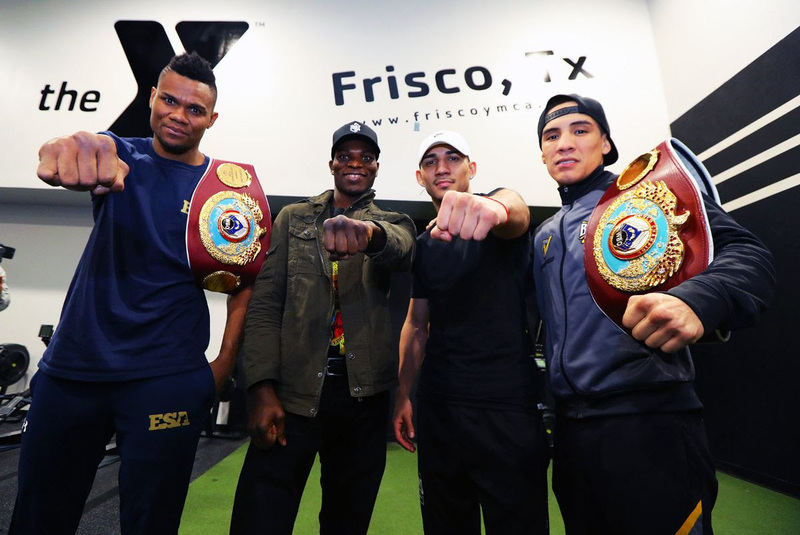 Three days before Super Saturday kicks off at Ford Center at the Star, four of boxing’s biggest stars — WBO featherweight world champion Oscar Valdez, WBO light heavyweight world champion Eleider Alvarez, 2018 Prospect of the Year Teofimo Lopez, and top lightweight contender Richard Commey — took time out of their fight week schedule to meet with local children at the Frisco Family YMCA. They discussed the hard work required to become an elite athlete, demonstrated assorted boxing drills, and then signed autographs to close out the afternoon. Lopez, whose Fortnite-inspired post-fight celebrations have become viral sensations, even demonstrated a few dance moves. Valdez vs. Carmine Tommasone will headline the ESPN/ESPN Deportes world championship doubleheader (10 p.m. ET) that also features the vacant IBF lightweight title fight between Commey and Isa Chaniev. The action will then turn to the OTT streaming service ESPN+ at 12 a.m., as Lopez versus Diego Magdaleno will serve as the co-feature to boxing’s most anticipated rematch — the WBO light heavyweight world title bout between Alvarez and former division kingpin Sergey “Krusher” Kovalev.